Secular Pro-Life is working on a new project to increase awareness of the fact that there are over six million non-religious pro-lifers living in the United States. Don't believe me? Let's do the math. According to the Pew Research Center, 19.6% of American adults have no religious affiliation. That amounts to about 46 million people. According to Gallup, somewhere between 15 and 19 percent of Americans who have no religious affiliation identify themselves as pro-life. Do the math, and it comes out to between 6.9 million and 8.7 million! Secular Pro-Life calls it six million just to be conservative and ensure that no one can accuse us of inflating the numbers. 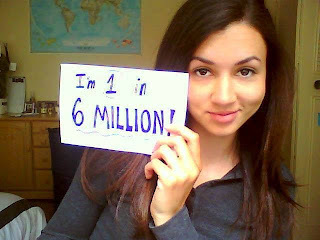 If you're a non-religious pro-life American, take a photo of yourself holding a sign that says "I'm one in six million" and email it so info@secularprolife.org with the subject line "One in Six Million." Include your first name, last initial, city, and state. It's so important to let non-religious pro-lifers know that they aren't alone. SPL gets emails every week saying "I thought it was just me! I'm so glad I finally found you!" How many more want to get involved, but are tentative about speaking up because they think no one will stand with them? That's why, once we have a critical mass of photos, we will publish them on the SPL website and begin a facebook advertising campaign. You can help SPL cover the costs of advertising here. Your gift will help us reach a vast new audience. Remember: the volunteer opportunity for photos is limited to non-religious individuals who live in the United States. If you're a religious ally and/or call another country home, you can help by sharing this blog post with your friends, and by donating whatever amount you are able. Thank you! The most common cause of Uterine Prolapse is trauma during childbirth, in particular multiple or difficult births. About 50% of women who have had children develop some form of pelvic organ prolapse in their lifetime. It is more common as women get older, particularly in those who have gone through menopause. This condition is surgically correctable. Uterine-Prolapse.net comprehensive and informative site for mothers who want to learn about uterine prolapse and find ways to deal with pain and stress of this condition. "Secular Pro-Life calls it six million just to be conservative and ensure that no one can accuse us of inflating the numbers." "According to Gallup, somewhere between 15 and 19 percent of Americans who have no religious affiliation identify themselves as pro-life." Sorry, but "no religious affiliation" does not mean "secular". Of those who do identify as "pro-life" and "no religious affiliation" that doesn't mean they have a secular basis for that position. Your arguments for your numbers aren't quite as bad as the ones for your positions...but it's close. Can't wait to share my photo! Us young, well educated, secular PL'ers are on the rise. Keep up the inspiring work. Matt, if "Your arguments for your numbers aren't quite as bad as the ones for your positions" (as you say), why are you constantly on this page, commenting? You shouldn't be bothered to waste your time. Notice how he has time to comment on new blog posts but not to continue arguments he starts in previous ones. Matt seems to be suggesting that the 6.9 million to 8.7 million pro-lifers with "no religious affiliation" must still have a religious reason for their position. And he calls our arguments bad? Tell, me Matt, how are these non-relgious people not using secular reasoning for their position? Matt's just standing up for his belief in a woman's right to decapitate and dismember her child's body. If you can even call them arguments, he kind of just repeats the same bumper-sticker points every time I see him post. It's not argumentation, it's hit-and-run. Yeah, I'd say that the arguments for the pro-life position are far superior to those for the pro-choice position. I did briefly engage Matt on a previous post, but he hasn't yet responded to my latest rebuttal. I think I would be within my rights to say that his arguments for abortion are almost as bad as his arguments against Christianity, but seeing as though this is a secular site, I won't go any farther than that. By the way, any relation to Bryan Kemper? As said by Deefr, the argument that people with no religious affiliation will have a religious reason to be pro-life is a bad one. How could they have a religious opinion on abortion if they have no religious affiliation? "Well I don't believe in/have a God/the bible/religion, but I'll say that abortion is wrong because God/The Bible/religion says so!" Seriously, think about it, that makes no sense. Not to mention all the religious people who use secular reasons for being against abortion. As much as I'd like to peg religious pro-lifers as people who always use religion for why they are pro-life so that maybe us Atheist pro-lifers could get more light and turn the stereotype a bit more on our side, I actually have heard of more religious pro-lifers who are secular with this issue than not. It really is just a stereotype. I'm sure it's still from the lies that Dr. Bernard Nathanson and them told, I mean after all, he admitted they really tried to make it seem like being against abortion was totally a Catholic thing, so that more people would be pro-choice. I just can't believe those stereotypes have lasted this long. "no religious affiliation" does not mean that they don't believe in a god. It does not mean that they don't believe in souls, etc. You should really understand these things. Sorry, LIVEACTION News. That's where I first read about Secular Pro_Life Perspectives. My correction. This does appear to be a good project to do, but it is worth noting that the public support (or lack thereof) that a specific/particular position receives does not make this position any more or any less valid (from the perspective of morality and what is/is not morally justifiable). That's not being asserted at all. The point of the project is to raise awareness. Most laymen believe that all PLers are religious, which is totally untrue. Increasing exposure will hopefully get people to question how one can be PL and non-religious. In other words, it spotlights the secular points against abortion. Furthermore it might make non-religious people more comfortable identifying as PL by showing them they're not alone. I ones got creamed for sharing your site. I was accused to spreading mis-information about a site that was not truly secular but consistent of people who have fallen away from their religious affliction and now have the audacity to call themselves secular. As I do have religious affiliations, I wasn't properly prepared to make a defence of your site, my apologies. Another friend of mine did a better job than me, however that didn't seem to satiate the opposition. That's bizarre. In my experience, many if not most secular people grew up in religious homes. If ex-theists aren't allowed to be called secular, than the secular movement is very small indeed. There just weren't that many atheists raising children back in the day. If someone converts to atheism, they aren't allowed to call themselves secular? I mean that's like saying if an atheist converts to Catholicism, they aren't allowed to call themselves religious. People change. Sorry; while SPL is open to religious people who are pro-life for secular reasons, this particular project is for non-religious pro-lifers only. 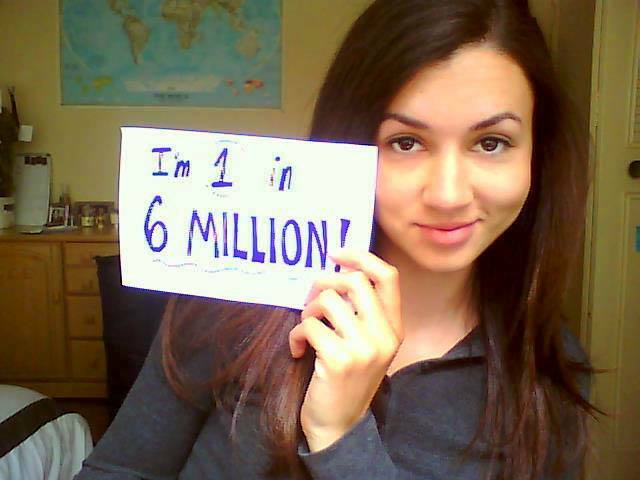 If we were to include everyone who is pro-life for secular reasons, the number would be much higher than six million!